Wednesday 20th September to Saturday 23rd. Shows at 19.30 with a matinee on the Saturday at 14.30. The judge has spoken – ‘Rehab or prison?’ But for the puffed up and ‘partied out’ pop prince in the dock it’s all too much. Welcome to The Glade: Cross dressing room mates, tanning addicts, group therapy and terrible food. It’s all too much! Kid needs a fix. Meet Lucy, she’s gorgeous, sensitive. It’s lust at first sight but Lucy has a dark secret, one that will plunge them both into a life-threatening dilemma. 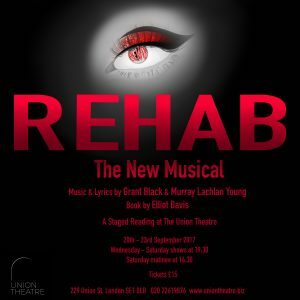 Join us in Rehab on a poptastic, rock bottom to redemption journey of heart, hips, boom-boom belly laughs and lightning quips. Hearts must be broken and songs must be sung; from a stunning score, that will live on in the heart and mind as we and our deeply loveable cast of characters seek the ultimate goal: love, peace, serenity and great choreography.